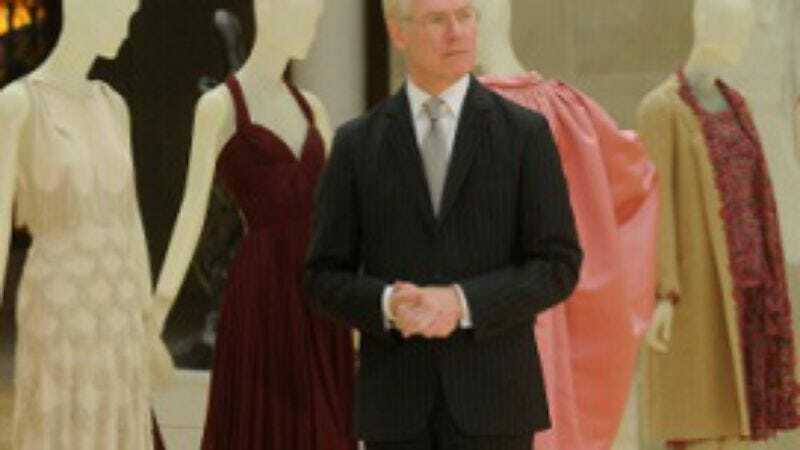 Project Runway: "The Highs and Lows Of Fashion"
"The Highs and Lows Of Fashion"
"I know that's the Met in front of us. I know exactly where we're going." In case you missed the episode and are just reading Mila's line above, you're probably thinking she weighed down her words with heavy sarcasm. No one says, "I know that's the Met in front of us," while they're talking about going to the Met unless they're under duress and lashing out at an eager producer's constant irritating prompts: "So did you have any idea where you were going for the challenge? Talk about that in present tense." But I can assure you that there wasn't a hint of sarcasm or joviality in Mila's delivery of those lines. She recognized the Met, and so she said "I know that's the Met." Like a small child, or a robot programmed to identify museums would. I bring all this up because I'm pretty sure there's a circuit board beneath Mila's severe bob (maybe that's why it hangs so straight). There is just something really mechanized about her that can only be explained in one of three ways: 1. She's part machine. 2. She's seen Blade Runner at least 1000 times, or 3. She's part machine and has seen Blade Runner at least 1000 times. Whatever the case, when Tim said to make "a high-end signature look worthy of a museum collection," somewhere in her mechanized, Blade-Runner-filled mind it made sense to her to make a high-end jockey costume topped with what looked like an exploded Members Only jacket. Of course. Apparently couture fairground employee garb crossed with Putty's 8-ball jacket in Seinfeld is Mila's signature. The really weird part, though, is that Mila won. I guess it really pays to make pants on Project Runway. When Heidi congratulated her on the win, she should have just said, "Thanks for making leggings!" Still, who else were the judges going to pick as the winner? None of the designers really pushed the high-end, museum-worthy, show-stopping aspects of this challenge. They were given $500! To do whatever they wanted with! But most of the high-end dresses looked like blahs—expensive blahs, but still blahs. The gowns were all safe: Emilio/Jacinda From The Real World London's putty-colored ensemble was very ladylike and pretty, but dull; Janeane/That Other Guy's black dress looked like a shiny power suit; Jesus and Amy's black, piece-meal gown was very well-done, but it just looked like a modern take on a 1950s Hollywood Barbie gown. Jay/Maya's black dress with the raised seaweed effect was probably the most interesting, but it too was pretty boring—especially for $500. On paper, this week's challenge should have been a pretty good one: Pair up (always good for drama) and create a high-end signature look that's worthy of a master collection. There was even a pretty-good twist: Also create a $50 look-for-less inspired by one of your competitor's expensive looks. The word that sunk the whole challenge, though, was "signature." Who cares if these designers can design things in the way that they want to design them? Their signature aesthetics are not interesting—yet. (Except for Ping, but that's because she just pins fabric to the back of a top, twists it around, and calls it a dress.) What is interesting is watching them try to showcase their signature aesthetics while working within rigid parameters. And, "Here's $500. Make something pretty. Also, museum!" are not interesting parameters. Still, this challenge made it possible for us to see Ping's "statue-of-liberty" "dress," so it wasn't totally useless. She was the obvious choice to go home, after all, the producers had probably wrung all of the comical, high-pitched- whimpering-while-running-around-Mood scenes that they were going to get out of her. But I did feel bad for Anthony, only because he made a dress that perfectly fit what this challenge should have been: make a modern, high-end look using these old couture pieces as inspiration. Yes, his dress looked kind of like a bumblebee costume by Dior circa 1952, but at least it was interesting. —Speaking of interesting, I wish they had lingered on the historical couture looks at the museum a little longer. —"We're designing a dress for the vice president of McDonald's. But everybody needs a dress." Oh, Anthony it's quips like that—and your popped collars, and your bow ties—that will keep you around…at least until Nina questions your taste level. —One more: "If it's on the floor, you abandoned it. Stop acting up in front of company." —Emilo/Jacinda's look-for-less dress was adorable. —Jesse punching his hand, hard, because Ping was annoying him at Mood was not adorable. —"It's like a cotillion party in the South from hell." Really, Kors? You thought a little bumblebee Dior mash-up was hellish, but the avant-garde 8-ball jacket wasn't?